✔ Certified by TFDA (Food and Drug Administration Thailand) ✔ Certified GMP (Good Manufacturing Practice) BENEFITS OF USING SNAIL WHITE FACE CREAM ∙ Gives you a healthier, brighter and firmer skin. ∙ Reduces acne scars, stretch marks, rashes, dark spots and freckles. ∙ Moisturizes your skin, leaving them smoother and softer than before! ∙ Controls oil and re-hydrates the skin. ∙ Reduces the size of your pores and does not clog pores. ∙ Reduces the cause of acne and irritation of the skin from sunlight and pollution. ∙ Delays ageing and reduces wrinkles and expression lines. 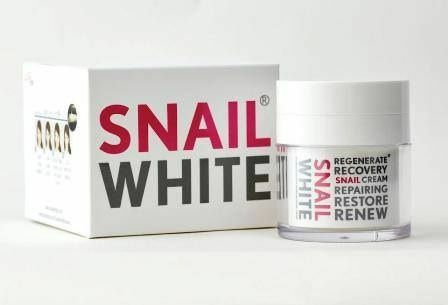 ∙ Helps your makeup to stay longer Who are suitable for Snail White Cream? ∙ If you have dry skin and want to exfoliate the damaged skin. ∙ If you have wrinkles, fine lines, rashes or even acne scars. ∙ If you have a delicate skin type Basically Snail White is suitable for most of the people at all age. Even if you don’t have one of the above, you can also use it. You can use it as your daily moisturizers too for a healthier and brighter skin. This cream is very good ..it absorbed well to my skin ..it lighten my skin ..it doesn`t cause break out..
authentic and effective.. i love it!